There is one constant in all matter in our world and that is ENERGY! Remember this saying, "Energy is Everything!" Look at science over the last one hundred years or so. We were told at one time the the smallest substance in our universe was an atom. This was non negotiable based on science for some time. As time went by and our technology improved, it was then recognized that an atom was no longer the smallest substance in our recognition. 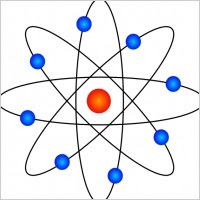 It was not recognized that within this atom, there is a nucleus and electrons surrounding this. So now the next question. If the atom is composed of a nucleus and electrons, what is the rest of the space within the atom? The answer is, you guessed it, ENERGY! Let's look at an example of energy and what this can do. My example for you is homeopathic remedies. Based on the understanding within homeopathy, like cures like. If you have poison ivy, you would actually find your relief by using poison ivy. The major difference though, is that you are not using the physical substance of poison ivy, you would be using the energetic blue print of the poison ivy, the frequency or energy. So what does this mean for matter in our world and what does it mean for us? Well, just as like cures like, like attracts like. Do you know anyone in your life that somehow finds "trouble" around every turn? Do you ever pay attention to their language? What do they always focus on? Think about? Complain about? What is their "energy?" I bet it is always about "trouble." Let's look at this deeper. All matter is composed of energy, a flower, rock, dog, tree, everything. So what makes us as human beings different from the energy of the flower, rock, dog and tree? We have the power of our mind based on the ability of our language. It really is true that we become our thoughts, which brings up a memory of an old saying we have all heard hundreds of times if we have not heard it once, "watch what you wish for." This is a very important saying because what we wish for, we typically get and this is all based on the energy within our language. Just to be clear about our language, this is our thought, spoken and written word. Where our language is, creates the energy within our atoms and attracts that very energy to us. So the next time you think you can or you think you can't...you're right! If you have any comments or questions in regard to this article, please post this below for me to answer personally. That is the best explanation of homeopathy and energy I have ever heard or read. Thank you! Funny how we all resonate with different explanations of energy. So thankful that you were able to benefit from this Joan.